How many roles does Michelle Pearson play before she changes a light bulb, picks out a wallpaper pattern, designs a floor plan or places a pillow? The owner of Bluffton-based Interior Motives probably plays more parts than there are colors in a paint chip wheel. “Many times I am a diplomat, a negotiator, a mediator and a counselor before we even look at pattern books or furniture choices,” Pearson said. In addition to furniture and accessories for the home, the interior design studio and showroom, located in Sheridan Business Park, offers gifts and jewelry in a broad price range, from everyday affordable pieces to upscale one-of-a-kind items. The potpourri of products is also a conversation and project starter. “My furniture displays often give clients a starting point,” Pearson said. “My job is to help tell a person’s story by designing a home or office that reflects his or her uniqueness. A home is an extension of a person’s personality, and the patterns, pillows and plans come after we assess together what that person wants to express. Before the hunt begins for functional and fashionable home items, Pearson and the client must gather information. As you might expect, a couple designing or redesigning a home requires a double dose of information gathering. “Oftentimes he wants comfort and a big-screen television and she wants an overall look, and sometimes those desires collide before we even talk design and décor,” Pearson said. Women usually want to look around at many items before they make a decision, whereas men often find a piece of décor and quickly grab it as if it were a hunting prize, she explained. Listening to both viewpoints and keeping the couple on course to the final product is Pearson’s main role as she guides them through the gathering and hunting processes to design their space. While getting her sea legs at an upscale design firm, Pearson noted that people from various backgrounds and socio-economic levels wanted advice for their homes, but some could not afford to work with a large firm. “When I created my own design studio, I wanted to be accessible for all types of projects,” she said. 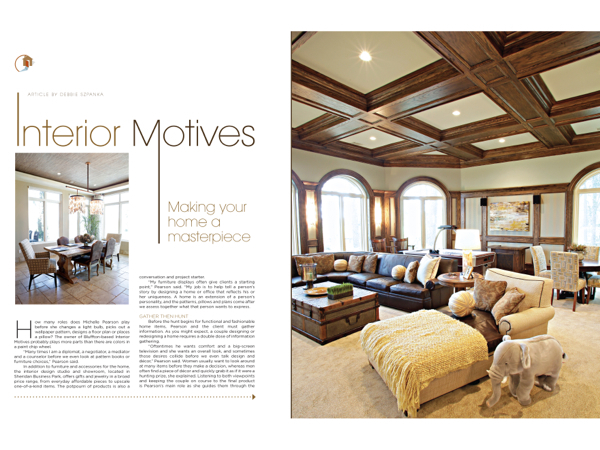 “Anyone who wants to turn his or her home into a castle should have a little guidance to create that sacred space.” Whether it’s a room, a garage apartment, or an 8,000-square-foot house, Pearson is ready and willing to help you find the function, form and fashion that best suits your needs and desires. Sometimes there are simple solutions to a space that a set of experienced eyes can bring. “Many times I just move an item in a room and that rearrangement gives the space a whole new feel,” Pearson said. “If I had a nickel for every time I heard, ‘I would have never thought of that,’ I could give away a free consulting session every month. After leaving her fingerprint on more than 500 homes in the Lowcountry, Pearson has discovered recurring themes. For one, she says that people tend to decorate their homes like they decorate themselves. “If a person is stuck and doesn’t know what color a room should be, the first place to look is his or her closet to discover what colors resonate with the client,” she said.